The National Aeronautics and Space Administration (NASA) has caught for the first time ever, the brilliant flash of an exploding star. 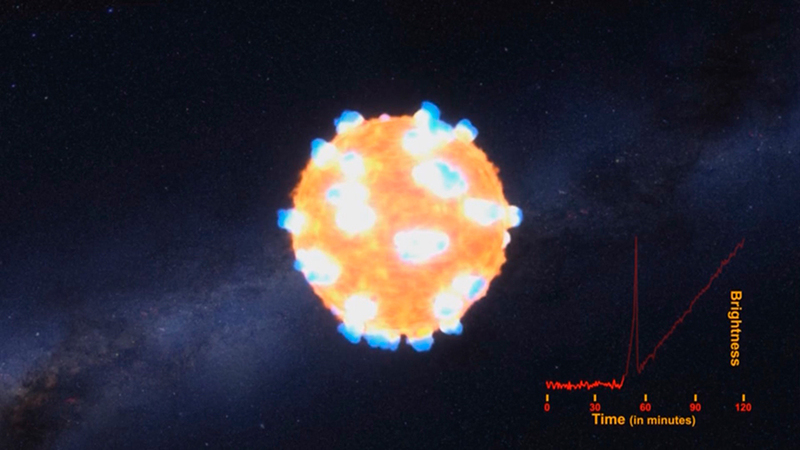 Calculating when a supernova is going to go off is not an easy task, however, Kepler space telescope was able to capture the unique moment when the explosion began. This magnificent discovery was achieved by an international science team led by Peter Garnavich, an astrophysics professor at the University of Notre Dame in Indiana. In order to capture the explosion, they had to search for more than 50 trillion stars, analyzing light emissions registered by Kepler during three years. The objective was to find signs of supernovae, which is a large explosion that occurs at the end of the life cycle of a star, as explained by NASA. It appears that supernovae are difficult to see in the Milky Way because dust blocks the view. According to a NASA’s statement, the explosion of two massive stars called “red supergiants” took place in 2011, when the Kepler space telescope was able to register the once-in-a-lifetime phenomenon. Both stars were huge, the KSN 2011a was 300 times the size of our Sun, while the KSN 2011d was 500 times the size of our Sun. Researchers have said that capturing a supernova is extremely helpful to understand its root cause. Findings demonstrate that the “shock breakout” itself lasts 20 minutes, said NASA on Monday, so what the team was able to do is considered as an important achievement for astronomy. NASA classified the explosions as “supernovae type II,” which begin when the interior part of a star loses its nuclear fuel. As a response, its core collapses as gravity takes over. Results would appear to show that the two supernovae converged with previously proposed mathematical models of Type II explosions. Understanding these type of explosions can help scientists to understand how different chemical elements have been scattered all around the Milky Way, since its formation began billions of years ago. Life exists because of supernovae, according to Steve Howell, project scientist for NASA’s Kepler and K2 missions at NASA’s Ames Research Center in California’s Silicon Valley. NASA announced that the latest discovery is a “tantalizing preamble,” since the Kepler telescope will be pushed to record more supernovae in the future. “All heavy elements in the universe come from supernova explosions. For example, all the silver, nickel, and copper in the earth and even in our bodies came from the explosive death throes of stars,” said Howell in a press release published by NASA on Monday.